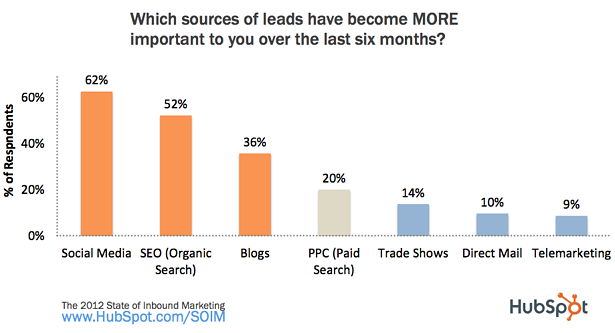 The question is addressed and answered--at least in part--by the new 2012 State of Inbound Marketing report, released at the end of February 2012. 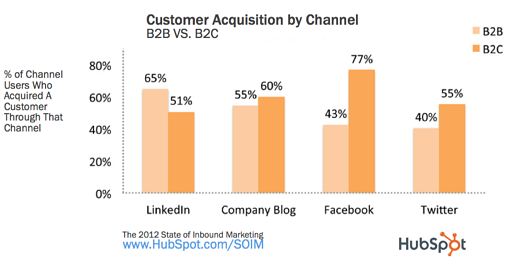 The report, compiled by HubSpot, Inc., summarizes the findings of a survey 972 B2C and B2B marketers conducted in January 2012. Respondents work in retail, technology, professional services, communications, media, and other industry segments. Most (72%) of respondents work for B2B companies. Their businesses range in size from a few employees to more than 500. Blogs and social media rose from 9% of budget in 2009 to 21% in 2012. Social media grew more than blogs, from 8% in 2010 to 13% in 2012. Blogs grew only from 7% in 2010 to 8% in 2012. Social media offer several benefits that are important to B2B marketers, including the building of awareness and brand. For technology marketers, social media can also help establish a reputation for thought leadership. But to satisfy internal skeptics, social media must deliver benefit that are easier to measure, with a clearer return on investment. They must generate sales leads, help acquire new customers, and deliver revenue. How, then do social media measure up against other channels for acquiring customers? More survey respondents said they acquired new customers through search-engine optimization, direct traffic to websites, referrals, and paid search than through social media. Among social media, a somewhat higher proportion of B2B marketers (65%) identified LinkedIn as a source of new customers than their company blog (55%). Note that survey participants were asked which sources delivered at least one new customer. They were not asked how many customers each source delivered. While fewer reported that both Facebook and Twitter delivered new B2B customers, both sources contributed. Note that everyone is so enamored with blogs; 10% of respondents said blog had become less important as a source of leads in the past 6 months. As a cautionary note, remember that general trends can't tell you which marketing channels are best for the markets you serve. The B2B markets you serve may be atypical. It's possible they don't use social media at all. Your best bet is always to ask your customers and prospects how they prefer to gather the information they use to buy products or services like yours. If you don't already have a company blog, start one now. Although social media have become more important of late, blogging is still a more effective channel for generating B2B leads. Increase the frequency of postings on your company blog to improve search rankings and generate more sales leads. Publish at least one blog post a week. Start your B2B social media work with LinkedIn. Once you're rolling with LinkedIn, explore Twitter and Facebook. Also keep a close eye on Google+. If you follow this simple sequence, you're likely to see the biggest return on your investment of time and effort. Do you have any thoughts or insights to share? Please tell us your own experience.